Is Your Organization Trauma Informed? The mission of Trauma Institiute International (TII) is to help organizations create trauma-informed cultures that increase compassion, resilience, health, and healing – locally and globally. To become a Certified Trauma-Informed Organization Trauma Instititute International uses a robust and relational approach to help leaders integrate trauma-informed principles into the DNA of their organization and its people. Trauma Informed organizations report having, greater employee retention, reduced absenteeism, fewer HR related problems, and increased engagement. The TII model has shown to relationally transform organizations and the humans living in them. The landmark Adverse Childhood Experiences (ACEs) study was the first significant research that discovered the connection between social experience and health. The ACEs study has provided overwhelming evidence about the profound impact of childhood trauma on health outcomes into adulthood. Organizations now recognize that a large number of their employees and clients have suffered the effects of toxic stress, trauma, and adversity. Sadly, mere knowledge of an issue does nothing to rectify it. Research has shown that awareness and trainings on how to respond is not enough –more is required. 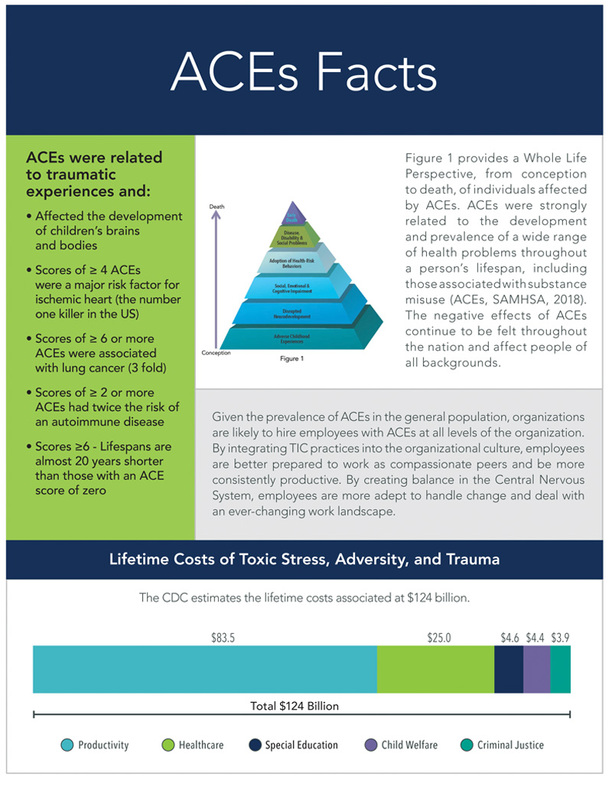 Knowledge of the effects of ACEs and the application of Trauma Informed Care (TIC) principles is proving successful in restoring health to individuals who have histories of adversity and ACEs. Application of information leads to transformation, and that’s where Trauma Institute International can help. The CDC estimates the lifetime costs associated at $124 billion. A trauma-informed organization alleviates or reduces these costs. Trauma Institute International believes that to be a great professional, you need more than knowledge. Our curriculum is designed to help you build a trauma-informed culture by applying what you learn to hands-on practical business applications. The information given to all employees will enhance engagement, work relationships and practical problem-solving. Completing the trauma-informed care certification process will establish knowledge and skills to drive greater stability and return on your investment. Organizations see the best results when leadership incorporates trauma-informed language. Leadership must “be the change they wish to see.” Commitment from leadership to living out the trauma-informed principles en-sures greater followership of their people. To fully integrate trauma-informed principles into the DNA of their organization, leaders are charged with identifying select champions to drive the collaborative trauma-informed efforts. Using information gleaned from an organization's Self-Study, Trauma Instititute International (TII) works with an Fulfillment Team to help integrate trauma informed principles into organizational policies, procedures, and practices. The Fulfillment Team will determine appropriate deliverables for measuring success and will develop measurable and timely goals for integrating trauma informed principles into these areas. The end goal of this team is to align operations to the organization’s mission, values, and trauma informed principles. To provide a customized framework for developing any organization toward becoming trauma-informed, TII assesses the organization to identify where and what kind of change will be needed. The customized Self-Study is the keystone of TII’s change model. Living into the message of trauma-informed principles is a lifestyle shift. From Boardroom to Copy Room, all members get to learn and live the principles. Coaching is a self-reflective process for adopting and living into the trauma informed care principels. The same self-reflective process follows each training. Humans are prone to get off course periodically, that’s why we need support and accountability. Without a tune up on occasion, it is difficult to sustain the change your organization just created; therefore, TII will provide coaching as needed for your organization. Tune-ups are a whole lot cheaper than an entire re-organization process. We have found that most leaders enjoy the ability to “check in for a tune up” throughout the entire certification process. Leadership must “be the change they wish to see.” Commitment from leadership to living out the trauma-informed principles ensures greater followership of their people. To fully integrate trauma-informed principles into the DNA of their organization, leaders are charged with identifying select champions to drive the collaborative trauma-informed efforts. 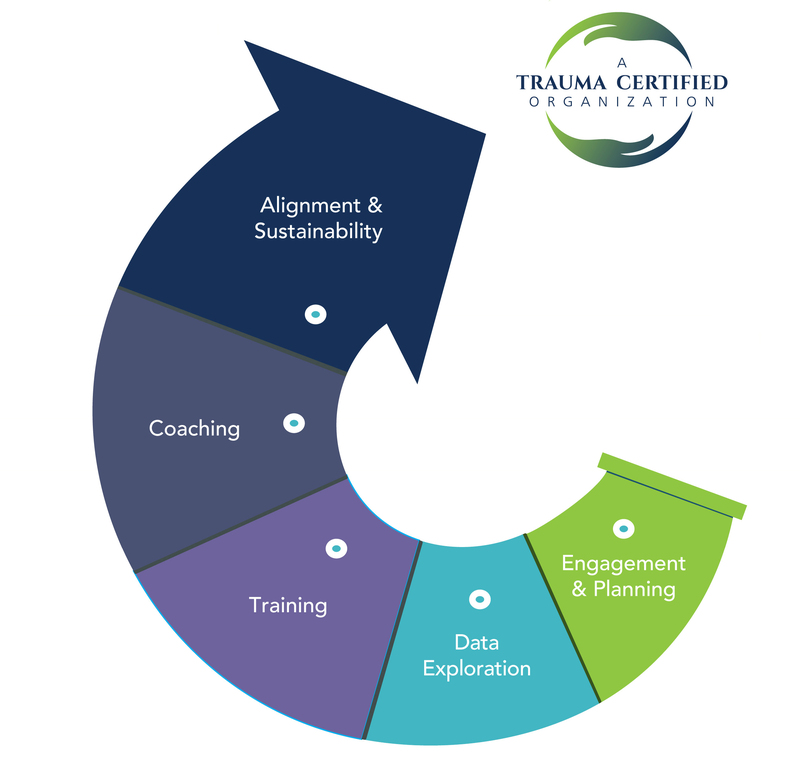 Using information gleaned from an organization’s Self-Study, Trauma Institute International (TII) works with an Fulfillment Team to help integrate trauma informed principles into organizational policies, procedures, and practices. The Fulfillment Team will determine appropriate deliverables for measuring success and will develop measurable and timely goals for integrating trauma informed principles into these areas. The end goal of this team is to align operations to the organization’s mission, values, and trauma informed principles. Evaluation and growth requires criteria to be clear, well developed, and consistent across the organization. TII helps align recruiting, hiring, on-boarding, training, supervision, performance reviews, and succession planning processes to the trauma informed principles. Living into the message of trauma-informed principles is a lifestyle shift. From Board room to Copy Room, all members get to learn and live the principles. Coaching is a self-reflective process for adopting and living into the trauma informed care principels. The same self-reflective proess follows each training. We promote alignment with the core organizational values and increase compassion, resilience, health, and healing for employees and clients. We help organizations become trauma-informed to increase engagement and retention while enhancing business outcomes. We support Leadership in the assimilation and integration of Trauma-Informed principles and practices. With more than 50 years of collective experience in behavioral, organizational, and educational leadership experience, we help individuals and organizations create significant, sustainable, and strengths-based change using the TII Model and Trauma Informed Care principles. © Copyright 2019 Trauma Institute International. All Rights Reserved.